How Does Low Quality Seafood End Up On Your Dinner Plate? You get an offer of $1.05 per pound for 2x frozen Pollock when everyone else is selling the same product for $1.28 to $1.33 per pound. Great deal right? If you’re a seafood buyer then you’ve probably found yourself in such a pricing situation which can translate into one of two things; 1) you’re getting a great deal on high quality product or 2) you’re getting a low price on a very low quality product. Nine times out of ten you are getting Low Quality Seafood at a Low Price. In this price driven seafood industry, most consumers have only been presented with the option to purchase low quality seafood therefore not knowing what quality seafood is supposed to look, feel or taste like.long as consumers don’t complain, restaurants, retailers and suppliers will continue to sell low quality seafood and consumers will continue to consume low quality seafood. Don’t bury your head in the sand when you know the seafood price seems too good. Not getting complaints does not equate to quality seafood. “I’ve been told it is 100% net weight”, “I’ve been told its low moisture” and “So far so good” are not great indicators to confidence in a quality seafood product. Test your product, or have us test any brand to allow your staff full confidence in the products they sell. 1) Over Glazing without calculating proper net weight: Using water to increase the weight of the fish making consumers think they are getting more fish but are actually getting more water weight. Note that applying a glaze to fish is not the bad practice as a nice protective glaze protects the protein in the fish. The bad practice comes from not subtracting the glaze (water) weight from the total net weight displayed on the packaging. 2) Thin & Broken Pieces: Thin pieces that are almost see through, after unfolding the bellies and/or tails the pieces break off. 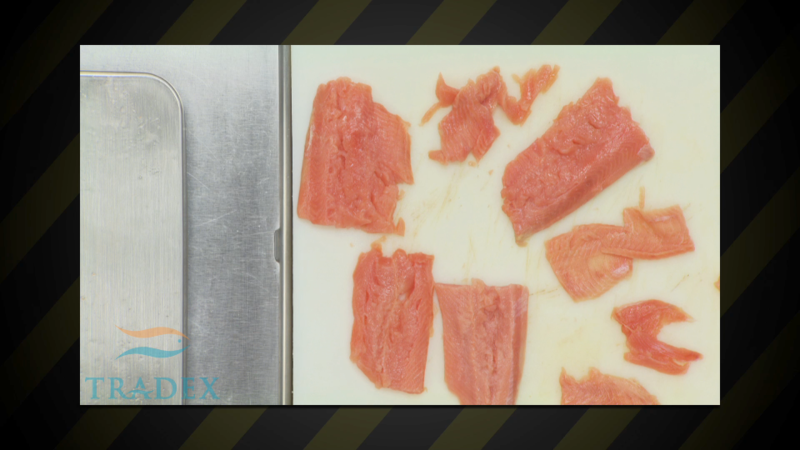 SEE MORE WAYS to spot low quality seafood with our Deceptive Seafood Practices article.